GREETINGS FROM SALE, four miles south west of Manchester city centre. I'm writing this on a hot midsummers day overlooking the water at Trafford Watersports Centre, next to the M60, formerly M61 motorway. Just beyond the trees and the electricity pylons is the River Mersey, which meanders its way west from Stockport, dividing Stretford, to the north, from Sale to the south, and continuing on to join the Manchester Ship Canal at Irlam. The Mersey, whose name originates in a word meaning 'boundary', used to divide Cheshire from Lancashire - Sale, Cheshire is what you'll see in many postal addresses, but since 1974, this area has been part of the Borough of Trafford, which stretches from the inner city areas of Old Trafford, across the Mersey, and down to the leafy roads of Bowdon and Dunham. And right in the middle of the borough is Sale. Driving from Manchester, your first impressions are dominated by the extremely busy A56 main road, which takes you into Sale after the M60 junction. Like many English towns, Sale is laid out on a 19th century scale, but has to cope with late 20th century traffic. Keep on the long straight road south and you'll reach Altrincham, but we'll stop here and look around. 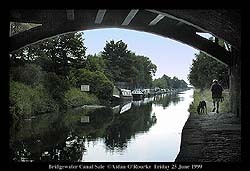 Running parallel with the A56 is the much quieter, but here, equally long and straight Bridgewater Canal, and next to it the Manchester to Altrincham rail line, now used by Metrolink trams. Sale is close to, but is not in the City of Manchester, and as estate agents say, it "benefits from convenient connections to the national motorway network". Maybe that's the reason why IT companies IBM and Cap Gemini have set up offices here on Washway Road, - that - and local taxes which tend to be lower than in the neighbouring City of Manchester. 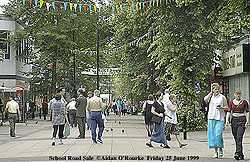 Sale is an area of leafy suburban residential areas, with long, tree-lined roads leading off to quiet cul-de-sacs. It's mostly flat - and nearby place names like Northern Moor, Sale Moor, Ashton-on-Mersey and Brooklands give a clue to the terrain as it was before urbanisation. Sale is said to come from "salh" - place by the willow tree. There are certainly lots of trees everywhere you look and in amongst the houses and roads, there are playing fields, recreation grounds and parks, including the very well-maintained and impressive Worthington Park, close to the centre. Every type of house can be found here, from Victorian mansions to terraced cottages. A semi-detached seems to be around the £80,000 mark, less in some neighbouring areas. 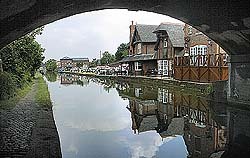 Sale Town Centre is cradled between old and new transport routes - the A56 and the Bridgewater Canal, with the rail line running next to it. Church street is now a pedestrian area, linking Washway Rd, which turns into Cross St, with the Town Hall, situated next to the Bridgewater Canal and Metrolink station. Shopping giants Tesco and the more recently opened Sainsbury's cater for the suburban population living in the residential suburbs all around. 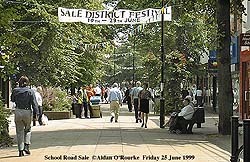 A desire to live dangerously and a liking for hills wouldn't be reasons to come and live here, but if you're looking for somewhere quiet and family orientated, with good schools and shops, and good connections to the city, Sale has lots to offer. EATON LANGUAGE CENTRE is the other place I visited today, to say hello to proprietor and director Joyce Eaton. She started the college originally as a language school, but now she's delivering unique and groundbreaking courses in... would you believe... football, or more exactly, Educational Football Tours: Goups of youngsters - whole teams in some cases - come to Manchester, well, Greater Manchester and work with local coaches and educators to improve their skills in football, English and other areas. It's a great idea - delivering one of Manchester's best assets - its football reputation and expertise - to people from all over the world, and educating them too. Joyce doesn't get involved in the coaching of course, she leaves that to experts from the FA. I've helped Joyce with the website, which is about to be revamped for the new courses, which start in September, ao if you want more info and know someone in Saudi Arabia or Seoul who'd like to become the next David Beckham, visit www.eaton-languages.co.uk. THE TRAIN CRASH south of Winsford, Cheshire has dominated the headlines over the past few days. On Wednesday morning, a Virgin Trains express from London Euston to Glasgow collided with a local train which joined the main line just south of Winsford Station. Thanks to the quick thinking of driver Roy Eccles, there were no serious injuries or fatalities. ROAD TOLLS and surcharges on company-funded city centre parking are definitely going to be tried out in Manchester - but the city council stresses that it's only on a trial basis, and improvements to the public transport system will take place at the same time. Down on the M4 west of London, the inside lane has been converted into an "express lane", causing a fifty percent increase in traffic jams. Eyewitess sayd: I hope they don't try that here. THE SHOAH CENTRE will be a museum to the Holocaust, located appropriately next to the new Imperial War Museum in Trafford Park, on the banks of the Manchester Ship Canal. Now this monument to the Jewish victims of oppresssion has been given a boost by the London-based Kobler Trust. The Manchester Jewish Museum is on Cheetham Hill Road. MANCHESTER'S SKYLINE WON'T be spoilt by another high rise building, now that a proposal to build offices above the roofline of Kennedy Street, next to Princess St and opposite Councillor Richard Leese's office, has been rejected. 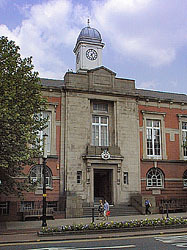 The Manchester Civic Society conducted a campaign against the proposal. They also dislike the office tower attached to the old Bank of England building on King Street, but personally I think it's OK.
BY THE WAY, on an experimental basis, I'm uploading one or two near-live pictures on most days - here are the most recent ones - so even if I don't send out an e-mail, check out the home page - you may see your home area - or yourself - from just a few hours previously. IT'S HOT, VERY HOT, well by Manchester standards it is, at 23 degrees this evening, but a certain bubble-jet printer manufacturer seems to have other ideas about our climate: in a recent advert, they said something to the effect of... "If pigs could fly, ... if there were blue skies over Manchester....." Well what's that I see in front of me as I write this? And what's that... blue thing in the upper part of many of my photos - it's not always a graduated fill in Photoshop. So why do people - particularly those who've never been here - continue to be negative about our weather? Bad attitude I think. Eyewitness says: Snap out of it! Have a look at what's there in front of you! 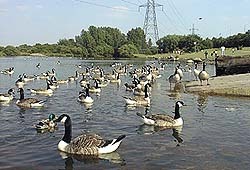 Today has been warm - a bit too warm for me, it's starting to remind me of the Middle East - At least those Canada geese - surely the most ubiquitous of Manchester's waterfowl - can cool off in the water. Tomorrow's forecast is for more sun, but the temperatures's going to drop when a low pressure area moves in over the weekend. Here's the sunset from a couple of hours ago taken, like all today's photos from Sale, on the Agfa E-Photo 1280, and manipulated in Adobe Photoshop. Bye for now.